From March 17-20, 2016 at New York City’s Pier 94 Think Fabricate will showcase its latest modern furnishings with finely crafted details at the Architectural Digest Design Show in the MADE section (booth M700), an area of the show dedicated to celebrating independent design from a select group of exhibitors. Marking the expansion of the brand’s thoughtfully designed range of furniture offerings, Think Fabricate will present its first ever dining table, featuring walnut hardwood and tapered chamfer edges. Alongside this new addition, Think Fabricate will display pieces from Kinetic, a collection of elegant, transformable furniture as well as its iconic “Brooklyn Classics” including expertly crafted cabinetry that defines the brand. A dynamic booth design featuring a prominent wall installation of hexagonal units – a common motif within the company’s work – will only serve to further highlight the modern, functional design philosophy, skilled craftsmanship, and appreciation of materials that Think Fabricate embodies. The new Tapered Chamfer Dining Table will begin a series of solid wood furniture from the energetic studio. 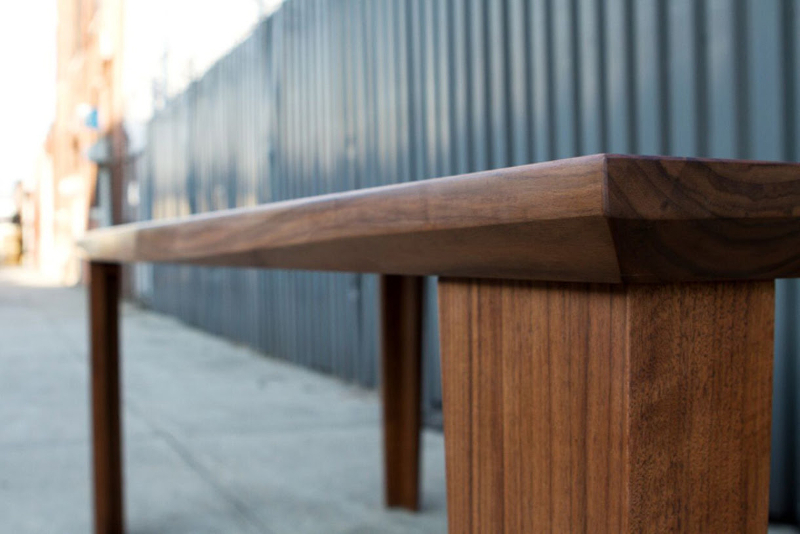 The walnut table features tapered chamfer edges – an angled cut that varies in width – running beneath the angled edges of the table top and framing the outside edges of the legs to convey a sculptural, elongated character. This design detail functions perfectly in tandem with the wood material, highlighting its inherent natural qualities and accentuating the table’s form. Think Fabricate will continue to explore the detail of tapered chamfer edges with the Tall Tapered Chamfer Mirror, a floor-standing wall-leaning mirror, designed so that the mirrored glass is set parallel to the wall, another subtle and provocative play with angles. The booth’s geometric exploration will continue with the hexagonal wall installation (in afromosia, walnut, teak and mirror), designed to balance the square and rectangular forms in the furnishings, and demonstrating the intriguing contrast that can be made between the juxtaposition of shapes. The honeycomb-effect composition will feature small scale shelving, mirrors, and wall-mounted plant holders in single, double and triple hexagon forms. Created in conjunction with Think Fabricate’s affiliated architecture firm, Doban Architecture, the installation demonstrates the architectural approach and spirit of collaboration that the brand manifests. Inspired by the company’s Brooklyn roots, where small spaces sometimes need to go a long way, is Think Fabricate’s highly adaptable Kinetic collection of space-saving, multifunctional furniture. 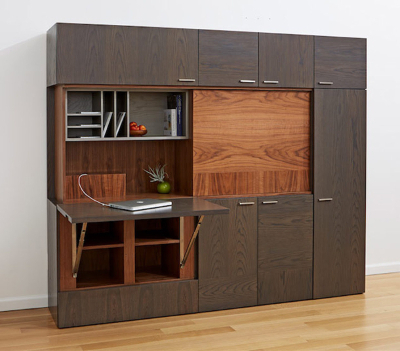 This unique range will be represented at the show by WORK n PLAY, a handsome media cabinet defined by various compartments, artfully concealed storage elements and a pull-up desktop surface that creates an instant workstation. 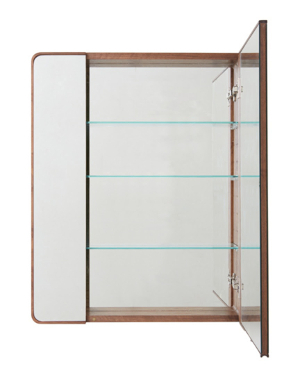 This cabinet is exemplary of the amazing versatility offered in the brand’s work. 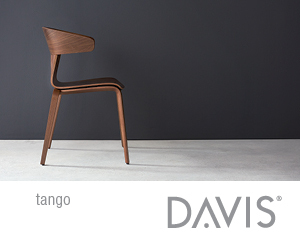 Complementing this range is TAKE a SEAT, a new product, which can serve the dual function of a stool or side table. It also carries through the tapered chamfer detail, making it cohesive with Think Fabricate’s pieces, both from Kinetic and other collections. 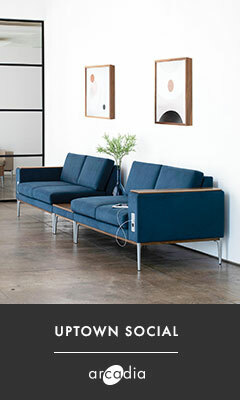 With a sleek, unobtrusive form, TAKE a SEAT can be easily stored to save space. 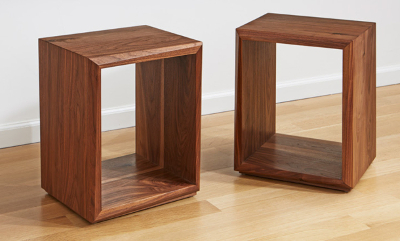 In fact, two of these stools can be neatly tucked away inside WORK n PLAY. In order to more fully represent its range of offerings on the showfloor, Think Fabricate will also bring back some of its “Brooklyn Classics,” a group products that epitomizes the studio’s mission and style. Among these defining pieces will be the Wall*Nut Medicine Cabinet, an asymmetrical mirrored medicine cabinet framed in finely-detailed walnut, and Think Lanterns, a modern take on antique lanterns in a variety of iterations, that can be mixed and matched to create eclectic lighting solutions. 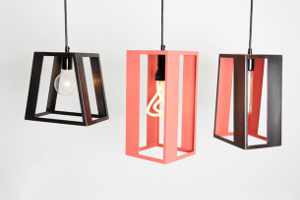 These lights will feature an updated color scheme – a range of lacquered grays – and will hang above Work n Play, popping out against the vibrant pink backdrop of the booth. In the spirit of celebrating the brand’s growing traditions, Think Fabricate will host “A Toast to Walnut” on Thursday, March 17 at 4pm honoring the unique texture, color and universal appeal of the material with a walnut liqueur tasting.